My boot camp classes have been packed lately, so I opted to do all body weight exercises to save on space, but mostly because we just don't have enough dumbbells for that many people! I used the same format as a workout we did a few months ago (High rep workout 30s 30 reps), but swapped out the dumbbell exercises for body weight ones. This is a good workout to do at home if you don't have any equipment (a mat would be handy, but a towel will also do). This workout is intermediate/advanced level, and will take about 30 minutes to complete. Take water breaks as necessary. 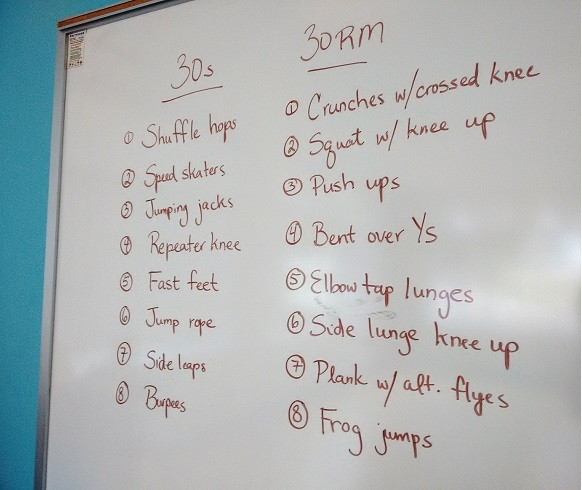 Perform 2 sets of each exercise, supersetting between 30s of cardio, followed by 30 reps of endurance. Rest for 10s between each superset. If you give this workout a try, let me know how it goes! I wanted to thank you for this great read about thi Compounding Pharmacy Near Tampa Bay topic. I definitely enjoying every little bit of it.I have you bookmarked to check out new stuff you post.